I was introduced to Notgrass Company last year when I was looking for a Government Curriculum for my Senior, that was centered around God. That is the heart of Notgrass! God centered for teaching the Heart, Soul and Mind! This summer we were able to delve into America the Beautiful Curriculm which is geared for ages 10-14 or grades 5th through 8th. Notgrass seems to be ahead of the curve when it comes to content so I believe you could even use this for a 9th grader for American History (which is what we are doing!). This study incorporates geography, history, Bible and literature all together.. sounds kind of like a unit study doesn't it? We love unit studies and any time a company can give us 'more' to get us excited about history, the better we do. History was never my strong suit as a child, given I was in the public school system with dry, boring text books. History can be made exciting and 'living' for our own kids with companies like Notgrass. 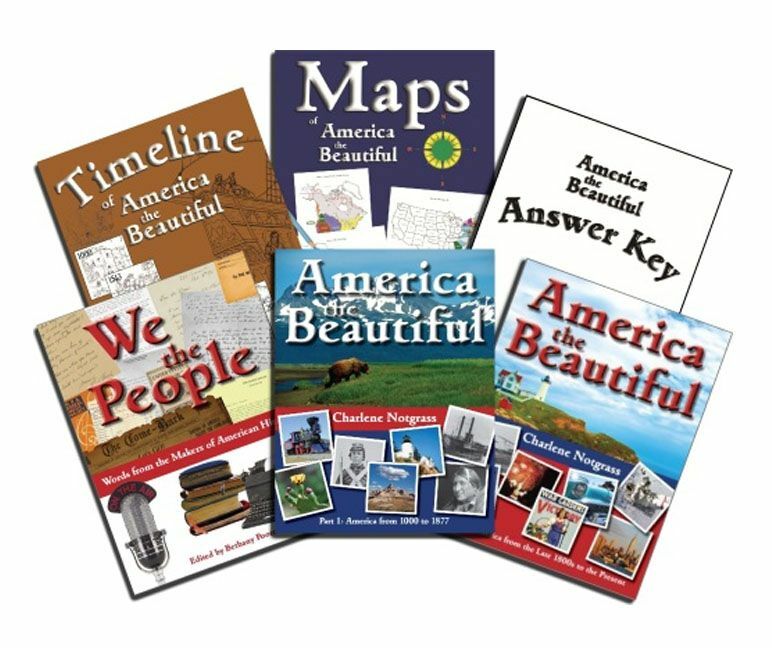 The America the Beautiful program came with 6 books. Here is a description from the website, courtesy of Notgrass, including links for you to see samples. This complete set lists for $99.95. The first three books are non-consumable to be able to utilize for your up and coming students. The hardback books are of very high quality, with exceptional photos and information. Well worth the investment for a program of this calibur. In addition to these products you will need a consumable workbook. I reviewed this with 2 of my children so we were able to see how they both worked. We used this together with my soon to be 6th and 9th grader. I enjoyed doing it together with both of them, as I feel American History is one of those subjects I can utilize a 'team approach'. I loved how they each could have a workbook, yet be working on the same lesson together. The book was easy to read for both of them, and not too over done with details and dates; the parts that always seemed to bog me down. I liked it so much for my 9th grader that we are going to utilize it for his American History high school credit. Notgrass continues to be a company that really impresses me in their knowledge, and instruction of history. Some of my crew mates reviewed this and an additional product from Notgrass. Click on the banner below to see what they had to say. I like homeschooling products that have a Christian background. It's even better when a company offers more than just the text. The addition of maps, timeline, and workbook all work together to give your child a complete curriculum. My grandson started homeschooling this year, but he isn't ready for these yet but might enjoy the maps and workbook. Thank you for reviewing our curriculum, and thank you for homeschooling!